Home > Municipalities > City Of Vaughan > Lake Wilcox Brewing Co.
Good beer awaits you at Lake Wilcox Brewing! Vaughan’s best craft brewery offering a beer lovers assortment of handcrafted brews on tap and for purchase in cans, bottles, and growlers. All beers are produced on site in the 6,000+ sq ft. brew house. Come for a tour, catch up with friends, play a board game or catch the game on TV, all while enjoying some great beer. Hungry? 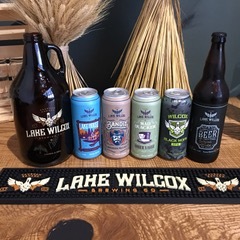 Lake Wilcox Brewery offers an assortment of light snacks for purchase and an express lunch Tuesday to Saturday. Be sure to check out the retail offerings include fresh cold beer, glassware, and apparel. The location is within walking distance to Vaughan Mills, local restaurants, hotels, easily accessible from the 400 highway, and is about 20 minutes away from Pearson International Airport. Other attractions in the area include Canada’s Wonderland, the Putting Edge, movie theatres and a children’s indoor playground right next door. Our beer is also available at your local LCBO & The Beer Store locations. Follow along on social media for information on special events and new beer releases. The brewery also serves as a unique venue to host your next event. Follow along on Instagram, Facebook or Twitter.